Do you want to Increase your Page Rank? Yes, Social Bookmarking is one of the effective method to increase your Page Rank. 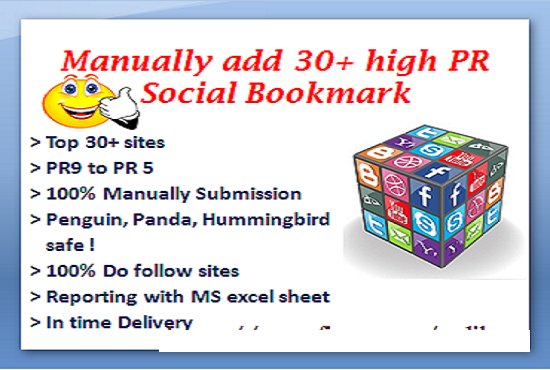 I will manually submit your website or articles or video links to 25+ Social Bookmarking PR10 to PR7 Sites like Twitter, Google+, Reddit, Linkedin, Stumbleupon, Diggo, Delicious and more. I will also create backlinks for faster indexing on search engine. > Following WHITE HAT SEO technique. > Google Panda4.o, Penguin3.o, Hummingbird safe! > Reporting detail in Ms excel sheet. > 100% customer favorable service.